Form meets function with Garmin's high-performance line of personal trainers - the Forerunner 305 & 205. The Forerunner 305 includes a high sensitivity GPS receiver, new courses feature and robust wireless heart rate monitor for optimal performance. 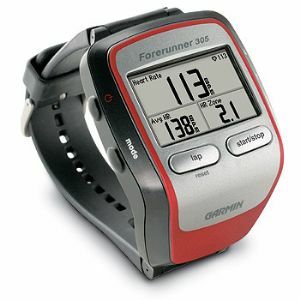 Forerunner 305 sports a unique design that wraps the GPS antenna around part of the wrist for a better view of the sky, and its high sensitivity GPS receiver provides highly accurate speed and distance data, as well as improved tracking under trees and near tall buildings. Forerunner 305 also sports a robust ANT wireless heart rate monitor with softer, more comfortable chest strap and superior battery life. It eliminates cross-talk with other devices to reliably measure and send heart rate data, and it helps you train in your optimal heart rate zone. Forerunner 305's courses feature lets you compete against previous workouts: you can compare your pace and heart rate to your past performance over the same run. You can also use Forerunner 305 to train for your next duathlon or triathlon with multi-sport workouts, a feature that lets you seamlessly transition between sports without resetting the unit, so you can use it for running, biking and more. Train indoors and still track your distance, pace and calories burned with the optional Foot Pod accessory. This wireless sensor attaches to your running shoe and transmits distance and pace data to your Forerunner 305 so you can still use it when GPS reception is unavailable. You can customise any of Forerunner 305's three main data screens - up to twelve data fields give you instant feedback on your workout. And, as with every Forerunner, each workout is stored in memory so you can review and analyse the data and see how you've improved over time. As an added benefit, you can plan, analyse and store data from your workouts using free Garmin Training Center® software, which lets you analyse data with interactive graphs that chart your pace, time, distance and heart rate. Overlay your run on a map so you can pinpoint specific areas and see how elevation and other factors affect your performance. Or, upload your workout data to MotionBased.com, Garmin's web-based application that provides in-depth analysis of your workouts, online mapping and route sharing that will take your training to the next level. Endurance athletes can also use the Forerunner with TrainingPeaks.com, an easy-to-use web-based training system designed to help athletes train for any event.